Michael may initially appear shy, but once he starts talking he will keep your attention! 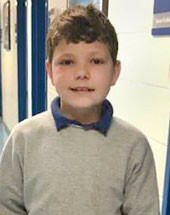 Michael enjoys being active, and specifically enjoys playing basketball and football. He also likes drawing and his favorite subject at school is science. Some of Michael's most prized possessions are his joke books and comic books. His favorite cartoon character is Sponge Bob. Michael has said that he hopes to be a soldier or police officer when he grows up. Michael does best with strong, consistent adults in his life who are willing to invest significant time in getting to know him and teaching him new things. Michael is a very kind child who at his core wants to do well and wants to please the adults in his life. Michael recently stated that he has been given three really good pieces of advice about life: make good choices, do what is right always, and be kind always.